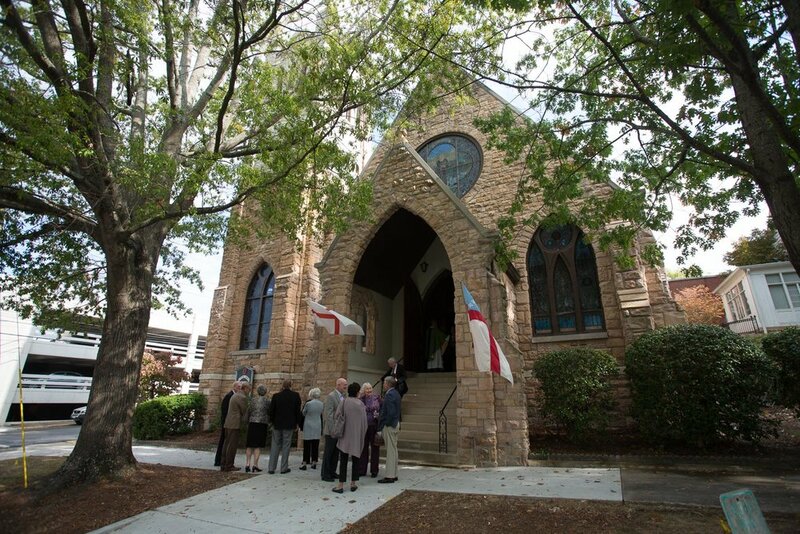 St. Peter's is the largest of two Episcopal parish churches in the small city of Rome, Georgia (population 36,407). It offers two Sunday liturgies in English and draws parishioners from around the county. The church building is a Gothic-revival, stone structure, finished in 1898. A major renovation in 2016 improved accessibility, as well as addressing issues with mechanical systems. The early-morning Sunday eucharist takes place in a small chapel, while the later eucharist takes place in the nave. Since the site visit, St. Peter's has launched a Latino mission, with a Spanish-speaking priest traveling from Marietta to lead a eucharist at 5 p.m. each Sunday. The service draws around 20 each week. The parish plans to add a part-time Spanish-speaking priest to the staff in the next year, to develop and expand the mission. Because the only demographic group that is growing is identified as Hispanic/Latino, this new mission appears to be a wise strategic decision. Rome is a small, racially diverse, Southern city. It is home to Berry College, a small, liberal-arts college. The population within three miles of St. Peter's is 55% white, 29% African-American, and 14% Latino. The average age is about the same as the statewide average (37.54 compared to 37.09). Per capita income is $18,136, significantly below the national average of $33,205. That income is not distributed evenly: median income among African-Americans is significantly below that of other racial and ethnic groups. Educational attainment lags behind than the state and national averages, as well, with significantly fewer adults over 25 having attended college or completed a degree. At the time of the site visit, St. Peter's offered two liturgies on Sundays; subsequently, a Sunday evening liturgy in Spanish has been added. The early morning service is said, without music, in a small chapel and uses the traditional-language Rite One texts from the prayer book. The later morning service, at 10:00, is the principal eucharist of the day, taking place in the main worship space. It follows the contemporary-language Rite Two texts from the prayer book, and it features hymns, anthems, and service music led by organ and choir. This is a fairly typical arrangement in many parishes; indeed, St. Peter's is in many ways a straightforward, middle-of-the-road, Episcopal parish church. The early service begins in a side chapel, off the main worship space. The service bulletin offers all of the prayer book text. The congregation this morning is older and mostly white, numbering 21. A vested server, carrying a cross, and the presider enter from the rear of chapel. The server stows the cross in a bracket on the side wall, and the presider stands before the chair, faces the people, and begins the service with the opening acclamation, collect for purity, and summary of the law. Both the kyrie and the gloria are said, and the presider prays the collect of the day. The server reads the epistle from the ambo, and then he leads the congregation in the recitation of the psalm. The presider reads the gospel from the midst of the congregation. Moving to the ambo, she preaches on the story of the unjust judge and persistent widow from Luke's gospel, teaching the congregation about persisting in prayer. The sermon, lasting about twelve minutes, is vivid and engaging, and it elicits responsive chuckles and knowing nods from the normally staid congregation. The presider returns to the chair and leads the creed. The server leads the prayer for the whole state of Christ's church and the world. The presider leads the congregation in the confession and gives the absolution, before reading the first set of the "comfortable words." The congregation exchanges the Peace, and the presider makes a few announcements. A member of the parish gives a seven-minute talk on stewardship (the parish is in the midst of the annual pledge drive). The presider prepares the altar with the assistance of the server, while an usher takes up a monetary offering. The money is brought forward, and as the presider receives them, the congregation joins in saying, "All things come of thee, O Lord, and of thine own have we given thee." The presider prays eucharistic prayer 1. The congregation kneels after the Sanctus. All join in the Lord's Prayer, and the presider breaks the wafer bread. A period of silence is kept, and then the presider says the fraction sentence, "Alleluia, Christ our Passover is sacrificed for us" and the Agnus Dei. The congregation joins in reciting the Prayer of Humble Access. Finally, the presider gives the invitation to communion. All come forward to receive at the rail. The quiet, meditative silence of the chapel during the distribution of communion is pierced by a very loud HVAC system, which seems to spring to life right after the invitation. After the distribution, the presider clears the altar with the assistance of the server, and then she leads the congregation in the post communion prayer. She gives the blessing, and the server (carrying the cross) leads her out of the chapel. At the door, the presider gives the dismissal, and all depart. The later service takes place in the main worship space. This morning, the congregation is primarily middle-aged and older, but there are also younger adults and children. There are 161 present this morning, a bit down from the usual number. The service booklet includes all of the prayer book text, to make things easier for visitors. The organist plays a prelude as the congregation gathers. Acolytes, choir, and clergy, all led by a verger, process into the church on an entrance hymn. The presider (the parish rector) reads the opening acclamation and collect for purity from the chair, and all join in singing the Gloria. The presider prays the collect of the day. Lay persons come up from the congregation and read the two lessons, with the choir (of about twenty members) singing a psalm in simplified Anglican chant between the two. A sequence hymn follows the second reading, and then an assisting presbyter processes into the midst of the congregation, accompanied by the verger, torchbearers, and a server, to read the gospel. The procession returns into the chancel while the organist plays a few bars of the sequence hymn. The preacher steps into the pulpit and preaches on the story of the unjust judge and persistent widow from Luke's gospel, teaching the congregation about persisting in prayer. The sermon lasts about twelve minutes. The presider leads the congregation in the creed, and a lay person leads the prayers of the people from the lectern, with most of the congregation kneeling. The presider leads the congregation in the confession of sin and gives the absolution. Everyone exchanges the peace. The rector, a clergy assistant, and a lay leader make announcements (lasting three minutes total), after which a lay person gives a six-minute talk on stewardship. The presider reads an offertory sentence, and the choir sings an anthem while a monetary offering is gathered and an assisting presbyter prepares the altar. After the anthem, the congregation sings the Doxology (to Old Hundredth) as the money is brought forward. Lay chalice bearers come up out of the congregation in street clothes and stand inside the altar rail. The presider leads the congregation in eucharistic prayer A, flanked by the preacher and assisting presbyter. All join in the Lord's Prayer. The presider breaks the wafer bread, and all sing the fraction anthem. The presider gives the invitation to communion, and then he, the assisting clergy, and the lay chalice bearers distribute the bread and wine at the rail, during which the congregation sings two communion hymns and the choir sings an anthem. After communion, the assisting presbyter and the server clear the altar. The presider sends two lay eucharistic visitors out from the congregation with consecrated bread and wine, to call on members of the congregation who are homebound or sick. Then, he leads the congregation in the post communion prayer and gives the blessing. The choir, clergy, and acolytes process out on a hymn, and the assisting presbyter gives the dismissal from the back of the church. The liturgy a St. Peter's is planned by the clergy, choirmaster, and organist. The verger and altar guild leadership sometimes attend the meetings as well. Planning is collaborative, but the rector has the final say. Long-range planning is done in semiannual meetings that cover such things as upcoming major services and liturgical seasons, while weekly meetings review the upcoming Sunday's liturgies. The congregation has filled the neo-Gothic building, and the church is landlocked, with no further room to expand on its lot. This meant that space constraints limited some of the choices that could be made in recent renovations to the church. Different design proposals would have placed the altar at the west end of the chancel or on the nave floor at the base of the chancel steps, but too much congregational seating would have been lost. Space demands necessitated moving the altar back towards the east wall, though with enough space for a celebration facing the people ("versus populum"). Tradition is important to this parish, but it has welcomed change that has been done gradually. In the renovations to the church building, the space available in the chancel was diminished and some seating for vested assistants was lost. As a result, the rector decided that chalice bearers would not vest, but would come up from the congregation at the offertory in their street clothes and stand near the altar during the eucharistic prayer, administer the cup at the distribution of communion, and then return to their seats. A practical problem necessitated this change, but it has been symbolically powerful. While it meant that chalice bearers were no longer vested and seated with the clergy, the rector explained the change in both practical and theological terms, and the change was accepted. Other changes were made without much discussion and yet were also accepted: the American and Episcopal Church flags were moved from the front of the nave to the parish hall, without explanation or complaint. The parish mostly uses Hymnal 1982, though they have begun to use Lift Every Voice and Sing II on occasion. There are some in the parish who would like increased variety in the music, drawing from other musical traditions, and others who are somewhat resistant. The choirmaster has used a "trial" approach to introducing new material, teaching a hymn during one Sunday service and then expecting the congregation to sing it the following Sunday. The clergy work hard to balance their desire for new and different hymnody with the choirmaster's concern to expand the use of the Hymnal 1982 and the desire of part of the congregation to stick to classical Anglican hymns. The rector has made some adjustments to the mid-week services. Before the arrival of the rector, the Wednesday evening Celtic eucharist included music played over a boom box. The rector ended that practice, so the service now does not have music. The service follows the structure of the Order for Eucharist, with eucharistic prayers from Enriching our Worship vol. 1 and online sources; he has been working to make the services more reflective of the liturgical seasons. He has substituted some texts in the Tuesday mid-day eucharist as well. One other significant change involved dropping the "children's liturgies" as the early services on Christmas and Easter, replacing them with typical eucharistic liturgies at those times. The "children's liturgies" had featured truncated hymns, children's sermons, and such liturgical embolisms as the flowering of the cross at Easter. Instead, the parish now offers straightforward eucharistic liturgies, with the heavy involvement of children in meaningful roles. The current form of the liturgies does not pander to children but includes them, and the result has been a growth in attendance at these services. The parish has made the decision to print full-text bulletins, to make the service more user-friendly for newcomers. This has borne fruit: worship attendance has grown, despite flat population growth in the city and county. 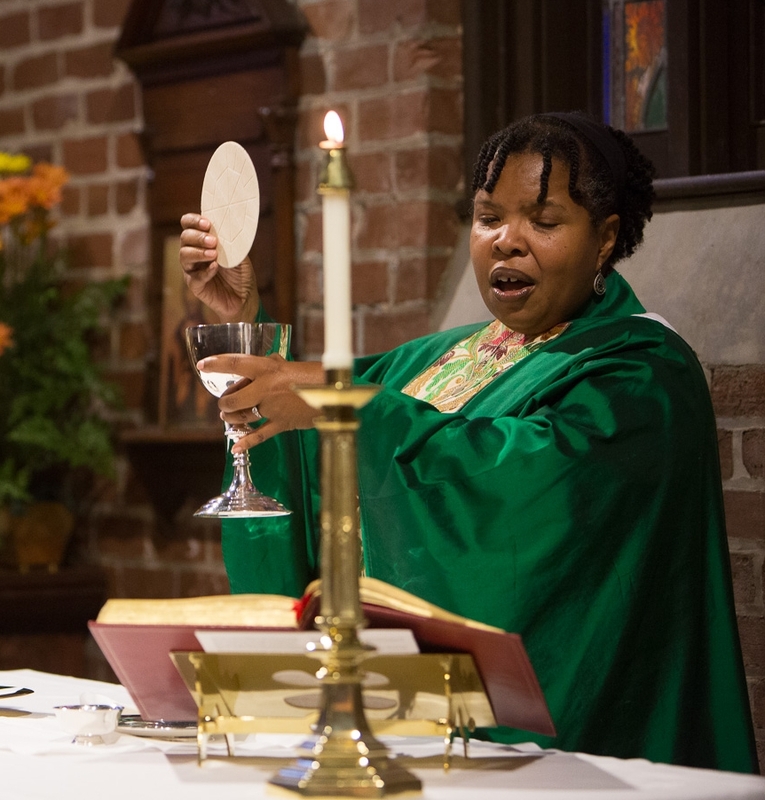 The congregation remains overwhelmingly white in a city whose population is much more diverse, but this is true of many Episcopal parishes across the country. The city of Rome itself is geographically segregated, and its churches in general reflect Martin Luther King Jr.'s observation that "11:00 on Sunday morning is one of the most segregated hours, if not the most segregated hour, in Christian America." (Meet the Press, NBC, April 17, 1960*). It can be a challenge for Episcopal parishes located in diverse neighborhoods to welcome their neighbors and accept that their neighbors will change the parish culture. The clergy's work to introduce Lift Every Voice and Sing II and their new Spanish-language ministry represent efforts to engage with the challenge. Overall, worship at St. Peter's represents a thoughtful, generally middle-of-the-road, broad-church, mainstream Episcopal approach to the liturgy. The congregation is clearly thriving and responsive, and the leadership is careful and deliberate.